Graffiti (Italian graffiti, from Greek γραφειν — to write) — is the name for images or lettering scratched, scrawled, painted or marked in any manner on property. Graffiti has existed since the times prehistoric when first human beings were scratching marks on the walls of the caves. This phenomenon raised from human desire to communicate. «Graffiti implements human desire to communicate.». Graffiti became the environment which changed the view of the streets in late 1990’s. And this word evokes numerous images in human minds. Whenever the researchers try to classify the graffiti images they surely fail. The reason for this is determined by the variety of the world and the artists depicting it. And though graffiti, as any other kind of art, tends to formalize the elements and average the manner (to preserve his audience the artist is to stick to the graffiti art rules). Nevertheless, the elements are too numerous and varied to unite them in several categories. Graffiti aesthetics and methods are applied in advertisement, design, video, etc. Graffiti exhibitions are regularly held in the official cultural institutions. In most countries, defacing property with graffiti without the property owner’s consent is considered vandalism, which is punishable by law. Graffiti is a rapidly evolving artform which has many different types and styles, and ideology. The graffiti artists are engaged either in legal (writing) or illegal (bombing) activity; write social or political messages or create true pieces of art. Graffiti is as varied as varied are the personalities creating it. Graffiti evolves all the time as it develops with the urban citizens. Graffiti is said to be one of the means for youth self-actualization. .
Self-name of the modern graffiti artists — writers. Thus, most writers tend to call their works «writing» rather than graffiti. In modern times, spray paint has become the most commonly used material. Spray paints are light, easy to apply and paint, bright and visually expressive, and paints are smoothly sprayed over most of existing surfaces. The spray heads and outlets of various types allow the writers to create special effects, powerful graphic elements and illusions. Graffiti combines the cubism technique and abstract graphic art; it is often difficult to read and sometimes looks mysterious. Graffiti sprang up in the 1970’s in New-York in the framework of hip-hop culture. Initially, the graffiti artists applied paints and markers and hand made their instruments. A «tag» is the most basic writing of an artist’s name in either spray paint or marker. «Tags» were mostly painted in the subway trains. Graffiti stepped into the second stage of its development in the second half of the 20th century. The researchers indicate two main factors which have determined spring up of the new graffiti forms. First, invention of spray paints and second, expansion of teenage culture in 1950’s-1960’s in the USA and Western Europe and later on, in Eastern Europe as well. All these factors increased the number of graffiti works and improved the quality of images and inscriptions. The main difference between the traditional (old school) and sub-cultural lies in the level of intelligibility of their subject matter for the casual observer. The sub-cultural graffiti which can be seen by any passer-by are nevertheless the unintelligible communication channel. In 2006 St Petersburg welcomed the international graffiti festival Meeting of Styles which demonstrated the high level of Russian street culture development. The festival was organized by the foremost Russian writers, the DS cru. Besides, every year many Russian cities host the Snickers URБANиЯ festival, the framework of which also includes the graffiti contest. Development of graffiti was determined by numerous graffiti paints, markers and spray heads entering the Russian market. There are 7 basic graffiti forms, and over a thousand of various writing styles. The forms are characterized by complexity, allocation and sizes. «Style is concrete for every «writer». It is determined by the forms of letters and the way they are tangled. «Определяется оно, прежде всего формой самих букв и тем как они сплетаются», says Henry Chelnut, the author of the Subway Art. Technical mastership and individual style can be achieved through constant and hard trainings. «There are no easy ways to master the complicated style and the time you spend on studies can not be compensated. Best way to learn something is to repeat. One has to pass from the simplest things to the most difficult ones. As if going through the history of graffiti». As well as the «draft» where the writer keeps and brushes up new ideas. 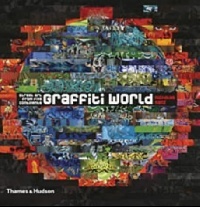 Summary: Let us have a fresh look at the art of graffiti and 35 years of its development. The Graffiti World takes us on an exciting trip through America nad Europe, and the most remote nooks on the planet. Taking 180 artists Nicholas Gantz, the author of the book, reveals the main development tendencies, and his vivid tales about the graffiti artists, citations and quotes will make you read the book from title-page to colophon. The foremost artists like Banksi and Os Homeos are found side by side with the young masters which allows the author give the exhausted information on the subject. The enclosure contains the artists’ bios, glossary and list of links.